The Beiras consist of two large provinces – Beira Alta (high) and Beira Litoral (coastal) – covering a large chunk of Portugal’s northern half. Again, it’s a region with a huge diversity of landscape, weather and culture. To the west is the long Atlantic coast and its scattering of beach resorts and port towns – including Aveiro with a population of about 74,000. Inland, is the ancient university town of Coimbra – now one of Portugal’s largest cities with its population of around 143,000 people. Moving east, the rest of the region is predominantly rural – the main cities of any size are Viseu (population of about 53,000) and Covilha (37,000). Read on for more information on the region or scroll down for details of rides and routes in the Beiras. L: Beach houses at Costa Nova near Aveiro. M: The Bucaco National Forest near Coimbra. R: The fairytale castle at Sortelha. Scenically, the region is mostly quite rugged. To the west lie several picturesque smaller mountain ranges – the Serras da Freita, Caramulo and Acor. The biggest mountains though are in the Beira Alta – including the Serra da Estrela, which contains Portugal’s highest peak and only ski field. One major river – the Rio Mondego – cuts across the region, roughly from Guarda in the north-east to Coimbra in the south-west – although numerous other rivers have carved out their own deep valleys. To the east – beyond the Serra da Estrela – the border country with Spain is less rugged and is more of a plateau, with rolling hills, wide open spaces and lots of dramatic castles but few towns of any size. The busiest parts of the Beiras for traffic are around Coimbra, Aveiro and the coast. Although Viseu is a fair-sized town, you only need to get a few km out to find quiet country roads. In terms of terrain, the coast is the flattest – and generally least interesting – part of the region. There are some scenic cliffs around Cabo Mondego (just north of Figueira da Foz) but then it’s just sand dunes and long beaches all the way to Aveiro and its huge lagoons. The beaches aren’t much good for swimming – steeply shelving with dangerous currents just offshore – and although easy the cycling is not that exciting. The resorts are also mostly tower blocks – some of them quite old and tatty-looking. Aveiro has a few interesting old streets but is a big town with large industrial areas. Moving inland, the dunes and flat coastal plain soon give way to rolling hills – and number of small to medium-sized towns along the line of the main north-south routes, the N1 and A1. Coimbra is definitely worth a visit but it’s a big city, surrounded by some unattractive urban and industrial sprawl. Moving inland, things quickly get rugged. There are plenty of scenic roads but don’t expect to get anywhere fast and either prepare for some long climbs and descents or find a route that will wind around the sides of the various ranges of hills and mountains covering the centre of the Beiras. You’ll also find large areas of woodland – much of it eucalyptus and pine grown commercially, as well as farms and extensive vineyards, particularly around the Rio Dao – one of Portugal’s premier wine regions. Plus lots of small towns and some picturesque villages. There are quite a few village campsites in the centre of the Beiras – although many are only open in the summer months – plus swimming beaches on some of the larger rivers. To the east of the serras (mountains), you’ll find some of the wildest, quietest parts of the region. Historic towns – many little more than villages – are scattered throughout this border region. The Beira Alta is also home to a string of spectacular castles and forts in various states of repair: including Castlo Rodrigo, Penedono, Marialva, Almeida, Trancoso, Sortelha, Sabugal, Penmacor, Monsanto and Idanha-a-Velha. Rides are listed under the name of the nearest main town. Click on the title for further information on each ride. Maps are included with the detailed profile. Idanha Circuit: A 50km (31-mile) ride through quiet, rolling countryside not far from the border with Spain. Start point is the Orbitur campsite near the Idanha Barragem (dam). 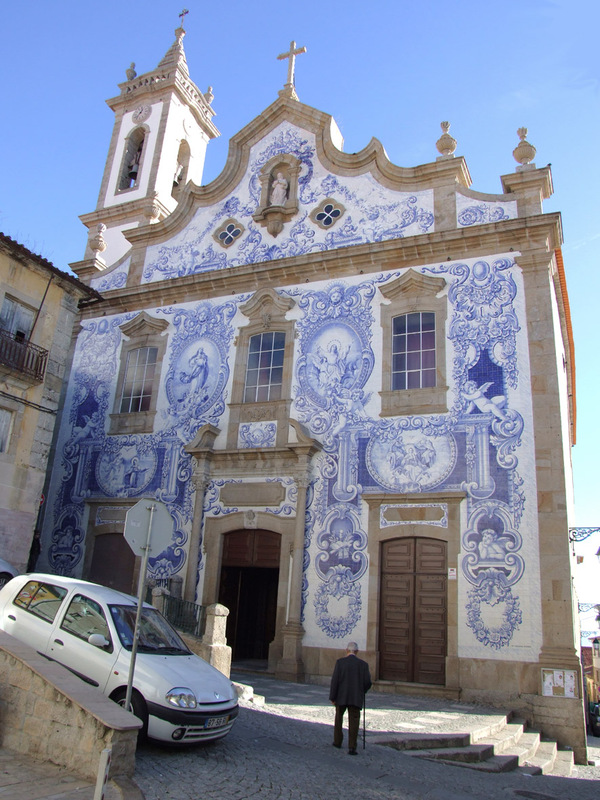 The route also visits the ancient, semi-deserted town of Idanha A Velha. Fantasy Castles: Formerly listed as Sortelha Castle, I’ve expanded the original half-day’s ride to include three castles, including one of the most dramatic and magical of the small castles that dot Portugal’s borders – plus more of the surrounding countryside. Trancoso tour: A full day’s circuit (70km/43m) of the country north of this delightful Beira town. Starts and finishes in Trancoso, visting Marialva and Penedono. Beautiful country, quiet roads and wonderful castles! See Viseu below and the Ecopista do Dao. Viseu doesn’t see large numbers of tourists but is the regional hub for some beautiful countryside, dotted with lots of pretty rural villages and towns. Ecopista do Dao:The old railway between Viseu and Santa Comba Dao has been converted into an ‘ecopista’, a sealed cycle track. Lots of tight chicanes to negotiate but some beautiful offroad scenery too. Easy riding (50km/30 m each way). Viseu villages: One of our favourite rides – this circuit takes on you on a scenic loop through some glorious countryside to the west of Viseu and also passes through a number of quiet villages. Great views of distant mountains, wooded hills and terraced farmland too. As well as day rides, also take a look at the maps for touring routes that go through the region. These might also provide you with ideas and opportunities for further rides. Border Castles Tour: heading north through wild open country and historic border towns all the way to the Douro valley. S2N Peniche to Coimbra: coming north through the Beira Litoral to Coimbra. S2N Coimbra to Arouca: along the coast to Aveiro and then inland to Arouca and the Serra da Freita. Sea to Salamanca: taking you roughly due east from the Atlantic coast at Aveiro towards Viseu and across the border to Salamanca in Spain.